Ok, this post is a little awkward for me. I wavered on posting it. I might delete it. I almost titled it "Tessa Poses with Her Cutting Boards" because that is pretty much what it looks like. I don't really do fashion posts and I almost always get a chuckle out of seeing other non-fashion bloggers, do fashion posts. I don't mind if you get a chuckle out of mine. :) I posted it because I always struggle with in-between season fashion, when you are over winter clothes but it's not warm enough for bare legs or short sleeves. 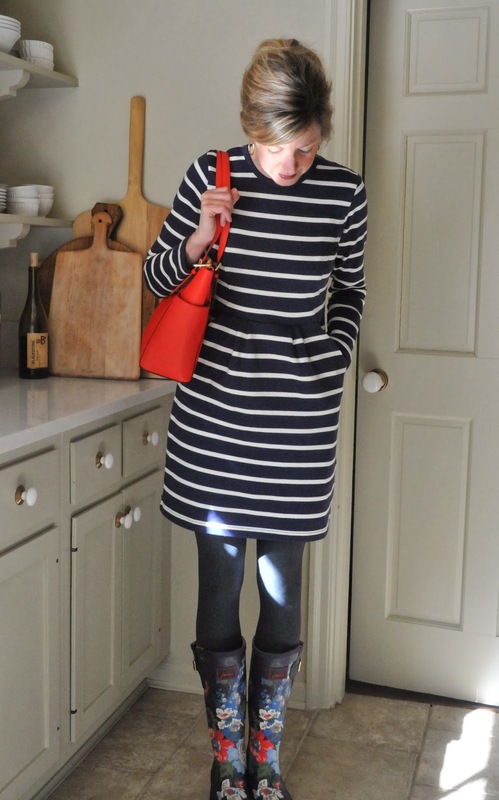 I recently bought this dress and these wellies from Joules and they are perfect for this time of year and exactly the sort of thing I would wear everyday if I could. Basically, the dress is as comfortable as wearing a sweatshirt, but it doesn't make you feel frumpy and the boots, well they are just fun. You look ADORABLE! You should do more posts like these. Now I'm off to check out that dress. Stripes are just so great, are they not? And stripes with florals? Perfect. Tessa, I know how you feel. Fashion posts are painful for me. I can never pose naturally like some do. You look adorable and natural. Love the dress and the darling rain boots! And love the cutting boards too!! You are a doll! I made your peanut butter cookies and they are yummy! Thanks so much! I third that you do more fashion posts! You look great and I love your style! Do the boots run large or small? Adorable!!!! Love the outfit and the cutting boards! Angela... so sorry, I hit delete by accident when trying to publish ur post!! You asked about dress size. I'm wearing a US size 4. Which is what I typically wear in Boden. I feel the fit is identical. I'm 5'7" for reference... Hope that helps! So sad, the dress sold out online in a size 4. I'm a bit desperate for it now and I see that Neiman Marcus sells this line. I might call to see if it can be tracked down. Please continue with the fashion posts. You are such a cutie pie and always look so put together! Rachel... Sorry, blogger is being a bit wonky and will not let me reply to individual comments.. Boots run true to size. So cute...thank you for sharing! Love this dress! You look pretty. I love your lipstick, too! I love your lipstick too! Mind sharing the color? 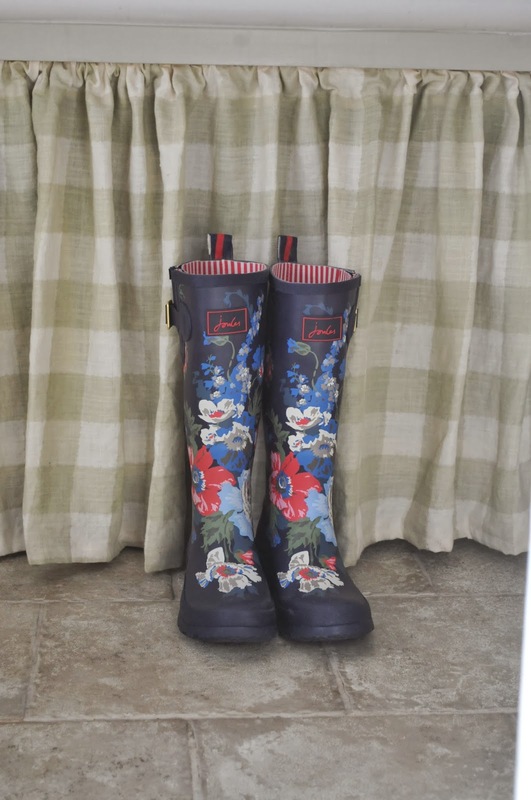 The wellies are absolutely fabulous! I might have to get myself a pair. The outfit is darling! Glad you showed it to us! About the purse, what brand is it and where to you get it? Thanks! Always love your style whenever we get a glimpse of it. Love this look! Perfect for this time of year. Keep up the fashion post they are great. My favorite part is how normal this is. It's much more real than standing on some street in the middle of New York. 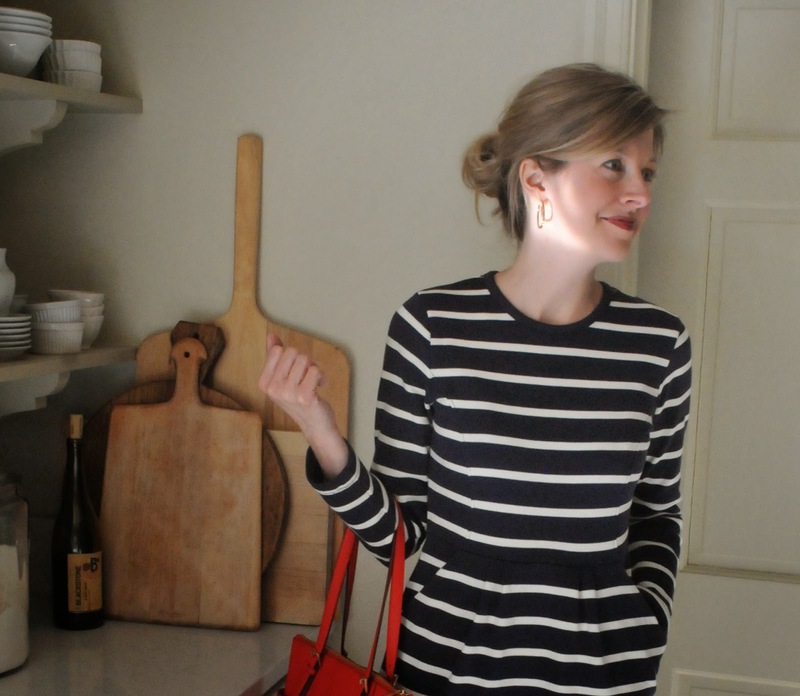 I'm a working mom and I love reading your blog & keeping up on Instagram because it is so genuine. Happy rainy day! 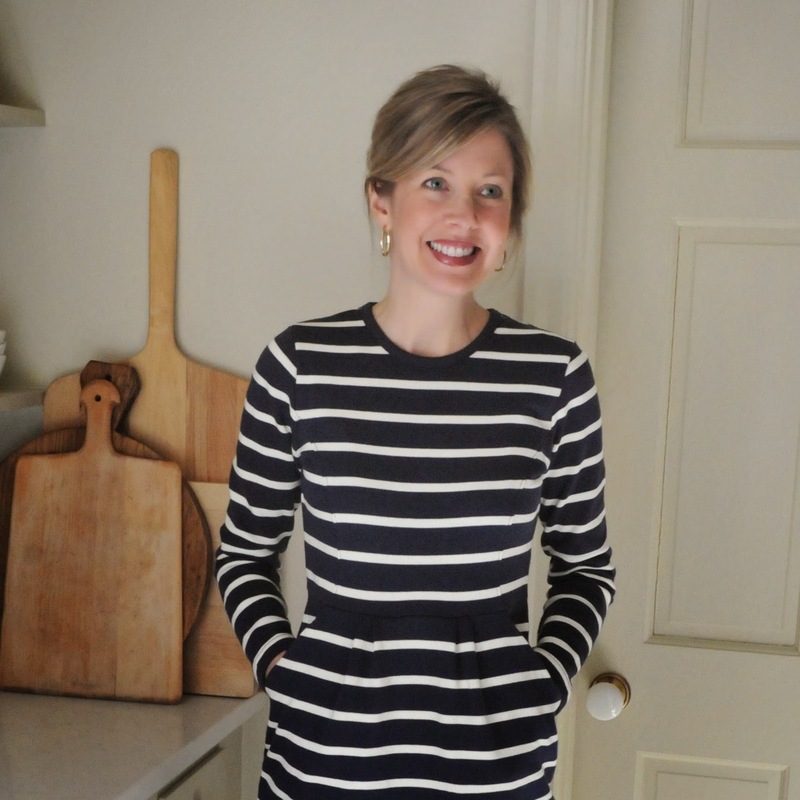 Love the dress - I am a big fan of Boden but I forget about Joules! Is the quality comparable to Boden? LOVE IT ALL! Love the dress, love the cutting boards, love the wellies, love the checked sink skirt. Right up my alley, every little detail. I always blush when I do selfies, then I look flushed or hot--it's silly and embarrassing! ;-) You made it look easy! You look fantastic! I love the entire outfit, very relaxed but stylish! Love the stripes! You are adorable. Crazy about those boots! And you make them look even cuter! xoxo! Please Tessa where is your amazing lipstick from? Gorgeous!! 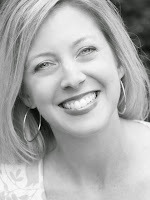 Please Tessa where is your lipstick from?gorgeous!! !thanks for sharing!